Letter from LP to Dr. Alexander Verrijn Stuart RE: was glad to hear of the work he did during the latter part of his stay in Pasadena. Goes on to discuss a matter involving the "Lewis-Calvin model." [Letter from Dr. Stuart to LP March 10, 1953] [Filed under LP Correspondence: Box #379, Folder #1]. 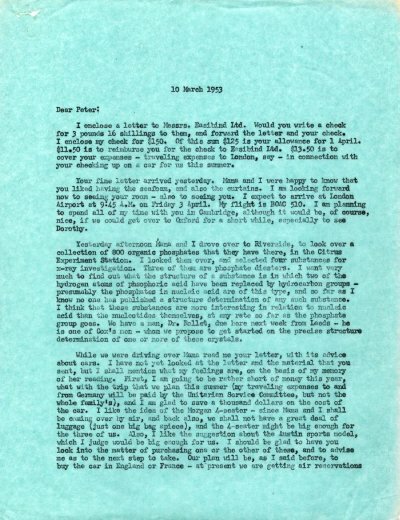 Letter from LP to Dr. D. P. Riley RE: refers to a letter of February 18, 1953 from Dr. Riley, and is glad to hear of his plans for coming to their meeting. Also recalls a letter of February 24, 1953 which he seems to have mislaid. Goes on to comment on the Chemistry Department at USC as Dr. Riley had requested in that letter. Also mentions that he and Prof. Vold of USC would reimburse him for flying expenses to Pasadena. [Letter from Dr. Riley to LP February 24, 1953]. Letter from LP to Dr. David P. Mellor RE: thanks him for his letter about Hans Freeman, has referred it to the Dean of Graduate Studies. Is at work on the problem of protein structure. [Filed under LP Correspondence: Box #246, Folder #7 (Mellor, David P.)]. Letter from LP to Dr. Wendell P. Woodring RE: was pleased to see him at the Academy tea. [Letter of response from Dr. Woodring to LP April 16, 1953] [Filed under LP Correspondence: Box #444, File #1]. Letter from Walter S. Vincent to LP RE: requests a copy of LP's paper on "A proposed structure for the nucleic acids." Asks LP if he intends to publish further papers on the same topic. [Letter of response from LP to Dr. Walter S. Vincent March 19, 1953] [Filed under LP Correspondence: Box #427, Folder #13]. Memo from LP to Dr. Blum RE: suggests that Blum examine the crystal structure of carnosine and anserine to determine if they are crystallized in the Lotmar-Picken muscles. [Previous memo from LP to Blum December 22, 1952].